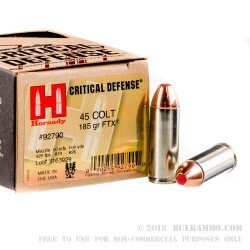 If you’re looking to set your Colt SAA or Taurus Judge up for home defense, this .45 Colt load from Hornady’s Critical Defense line might be your best bet. Hornady has combined this classic cartridge with the latest in bullet technology, loading a 185 grain FTX Flex Tip bullet to a muzzle velocity of 920 feet per second. The soft polymer-tipped jacketed hollow point offers strong penetration through heavy clothing for reliable self defense. This load is optimized to perform well in any barrel length, including that of the Judge. 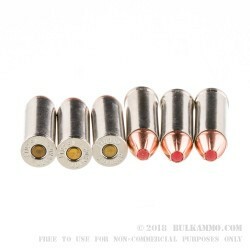 Each box of 20 rounds uses Boxer-primed, nickel-plated brass cases. 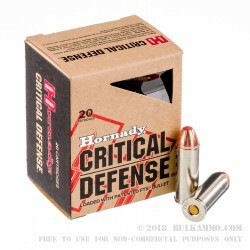 Hornady is a high-end bullet and ammunition manufacturer located in Grand Island, Nebraska. Founded in 1949, the company spent the first several of its decades supplying other ammo loaders with premium bullets. In the 1980s, the company began loading its own ammo and currently offers in-house cartridges using its own FTX, XTP, TAP, and Z-Max bullets as well as a selection of shotgun shells.